It's May 1st and that means today is all about a brand new Farm Fresh Challenge at The Greeting Farm! As you know, a new challenge is issued at the beginning of every month over on the TGF blog and this time around it is... 'Swing Into Spring'. 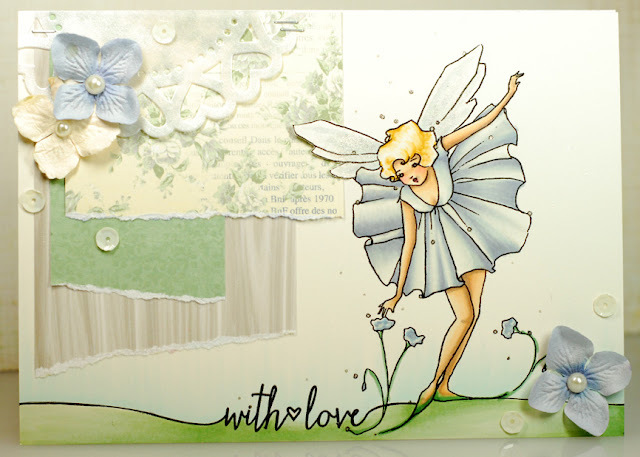 This theme is loaded with possibilities, inspiration can come from spring time color schemes, spring activities or even the unpredictable spring weather. 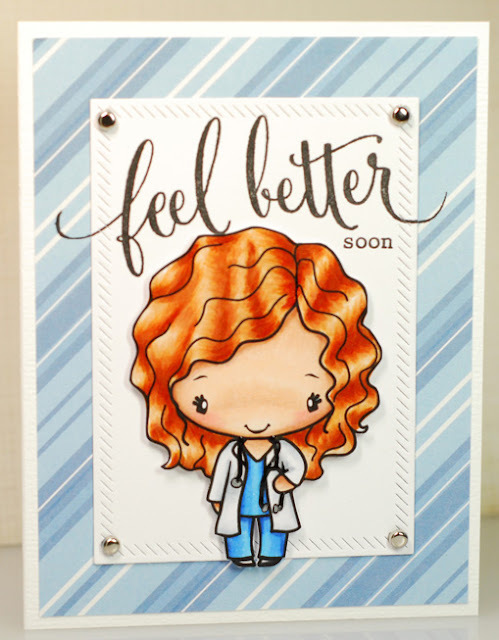 All you have to do is ink up a character from the TGF store that best encapsulates your interpretation of the theme and you could win a $50 gift certificate! For my card today I pulled out the Ever After stamp kit to create a super cute scene. There are so many adorable little Beans in this set, all dressed up like characters from a fairy tale, it was hard to pick just two to color up. 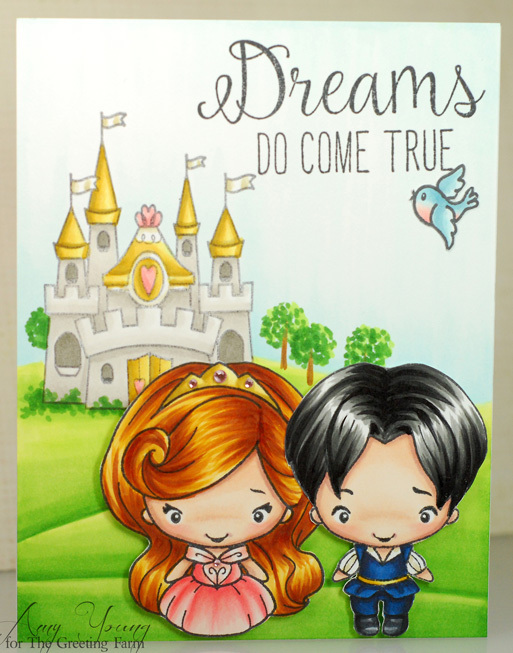 When I finally settled on this couple I ended up going with an Ariel and Prince Eric look for them. And I can't even tell you how much I love the castle that is included in the set as well. 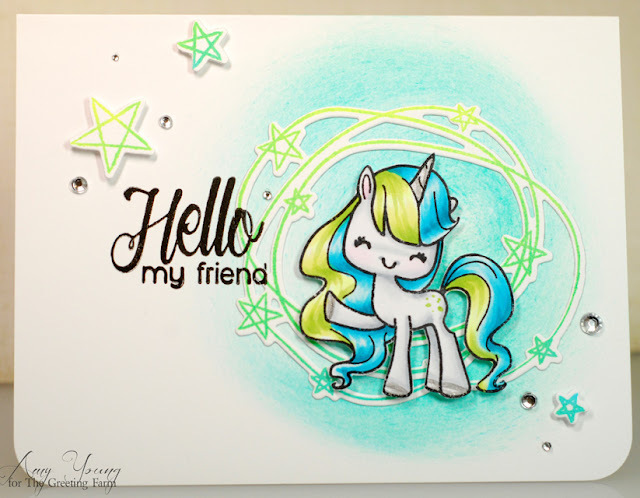 I stamped it in grey tones and kept my Copic colors less intense to try and make it look like it was further in the background. Alrighty, it's off to work for me. Have a good one! 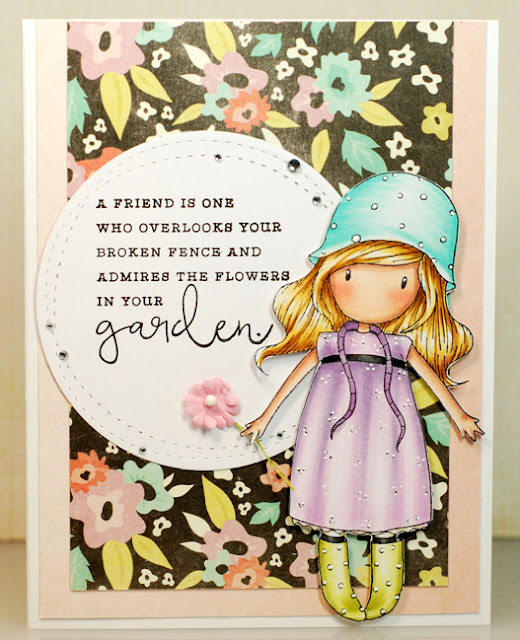 This card is up over on The Greeting Farm blog today too as part of the CardMaker Magazine blog hop that is going on. 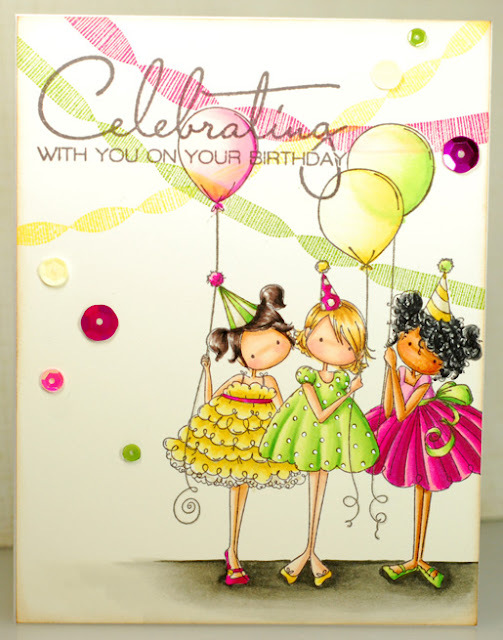 So be sure to check that out and get in on the fun! 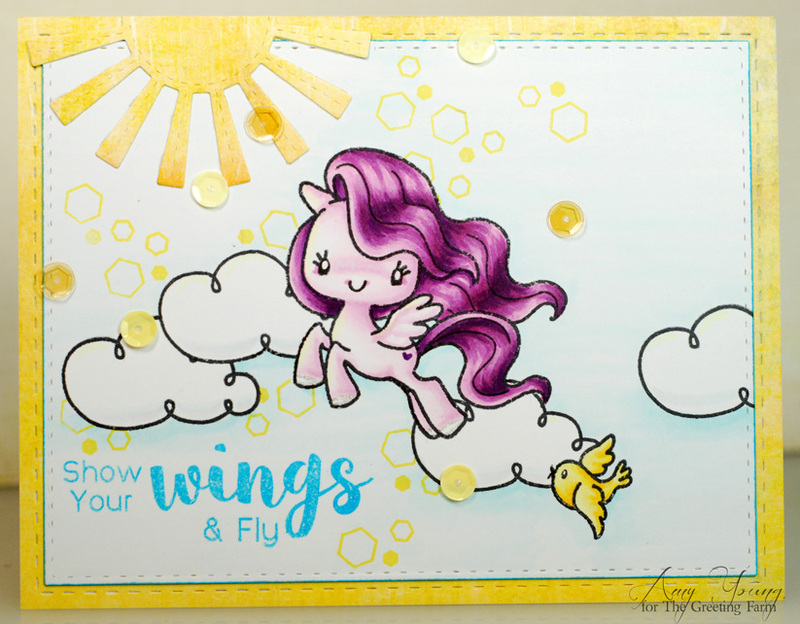 It's time to take to the skies with the super cute new pegasus set called Your Wings. I love it so much that when it came time to make my card I used every single stamp in the set, plus an extra from Glitter Bomb, to create this scene. Everything just works so perfectly together that how could I not? 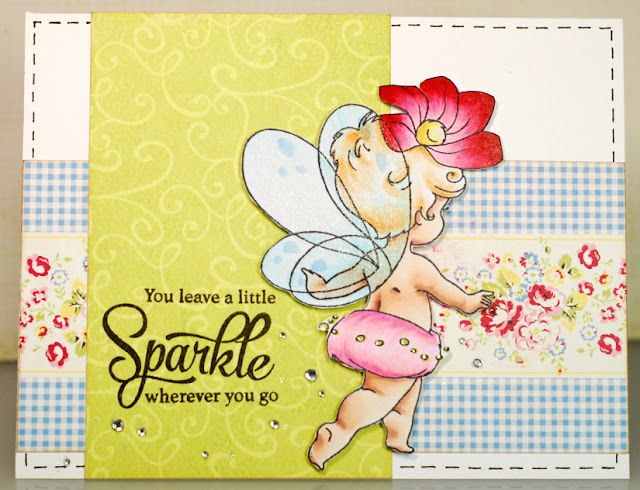 I was masking off stamps like crazy to give the illusion of layers on a primarily one layer card. 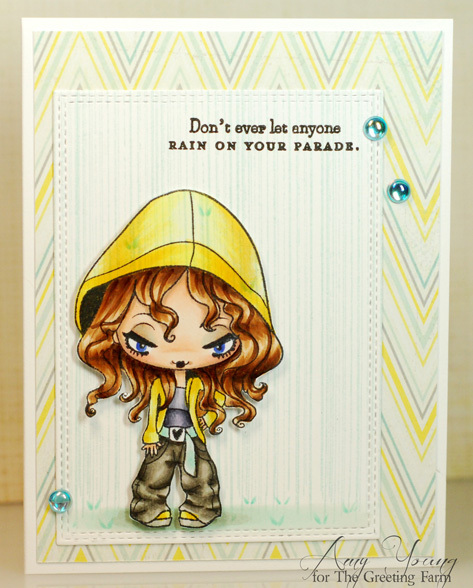 Though I couldn't resist throwing on that stitched sun die and a few sequins to really help pull everything together. 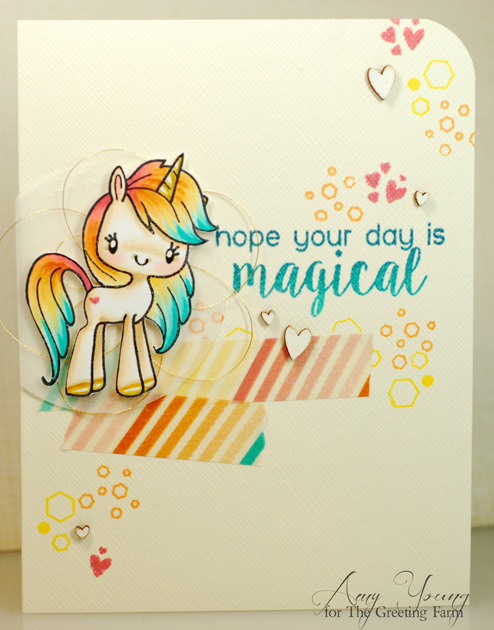 Another bright and happy card with these happy new magical ponies... so much fun! Hope your week is off to a great start. Laters! 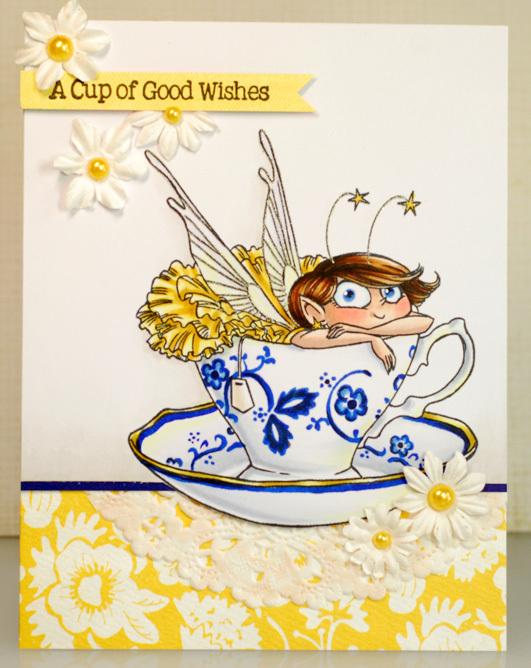 Now be sure to check out the TGF blog to see what my fellow Farmers have created with these magical new stamps! 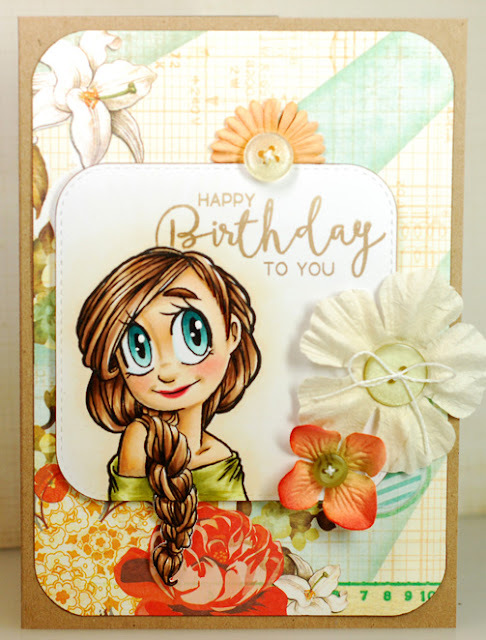 So last month I saw a card on Pinterest using a pretty little mermaid stamp by Elisabeth Bell and I just had to get my hands on it. So I immediately tried to find out where to buy it only to discover that they were released a couple years ago by Sweet Pea Designs which has since gone out of business. Disheartened but not discouraged I continued my internet search hoping to get lucky. After a couple strike outs I stumbled upon a little stamp shop that is sadly closing its doors as well but in the meantime has big discounts on all their remaining inventory. It's called The Stamp Room and while the exact mermaid that started my hunt was already out of stock I did find a few others to get just as excited about. 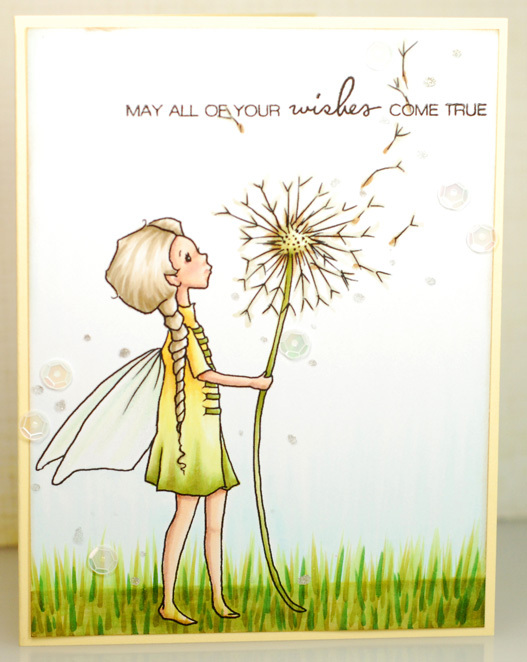 I also stumbled upon this baby fairy called Flit that just stole my heart. I paired her up with some random paper scraps that were on my desk and kinda make it look like she is running into a field of flowers. 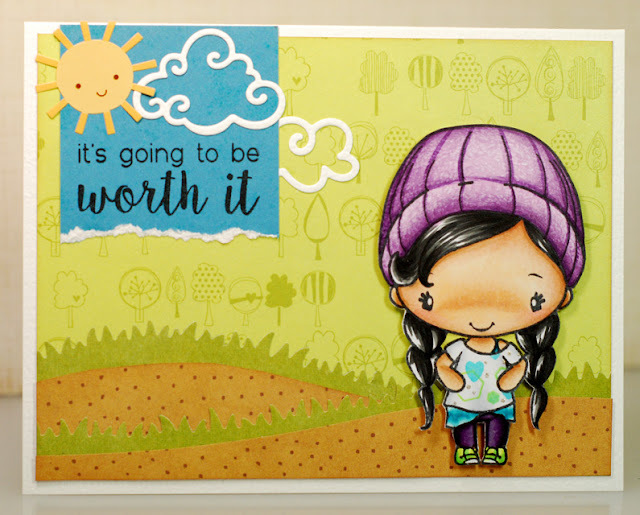 The sentiment is Papertrey Ink and I think it is pretty darn perfect with little Flit. This card was a lot of fun to make. Ok, thanks for stopping by today! Ok then, time to get ready for work. Later gators! Ok I really got to go now. Talk at'cha later! Alrighty, gotta scoot my boot... TTYL! This past Thursday I was watching Project Runway All Stars and their challenge was to create an Ath-leisure look. This was new to me but basically it's high end active wear that can be worn outside the gym. 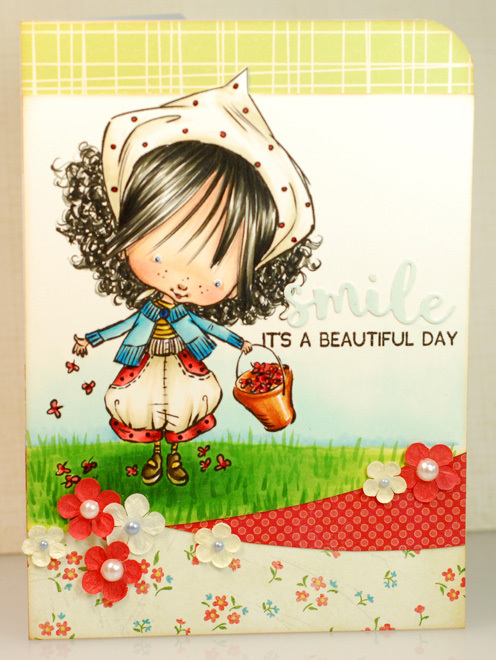 So imagine my delight when immediately afterwords I got the mail and this awesome Anya was my April stamp from the TGF Super Secret Stamp Club. She is called Relax Anya but I think I'm going to be calling her Ath-leisure Anya, LOL! Seriously, she looks like a stylin' runner in her leggings and artfully layered tank and t-shirt. I wanted to make her top shirt special with a cool print so I grabbed a couple of the small accessory stamps from the Glitter Bomb set, masked off her arms and neck, then stamped them on in some bright neon ink. 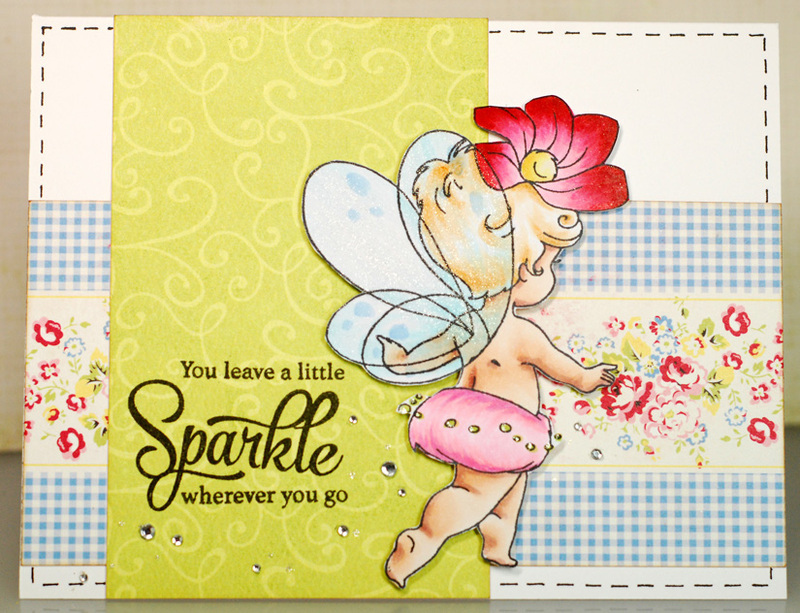 I dotted on some sparkle with a Stardust glitter pen for extra pizazz to complete the look. The motivational sentiment is also from the Glitter Bomb set and I really like how it plays off Relax Anya's strong, self assured pose. Alrighty then, have a good one everybody! 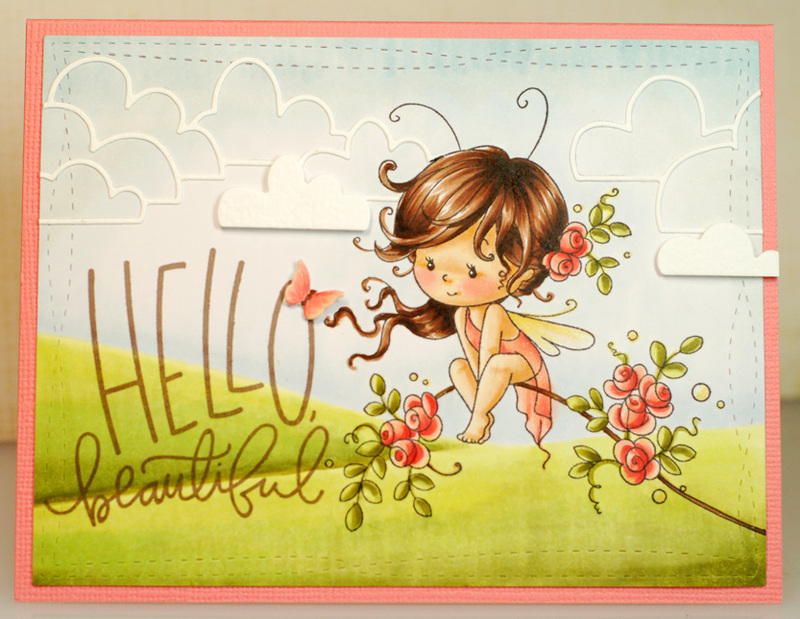 With the introduction of so many amazing new clear sets at The Greeting Farm I was inspired to go back into my stamp stash and pull out the very first TGF clear set that I ever got. 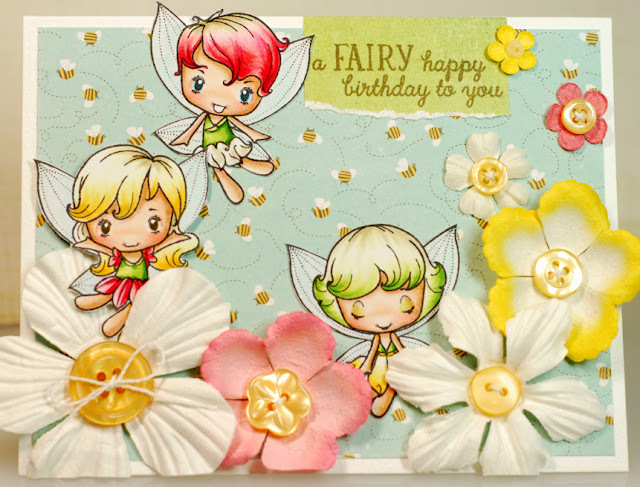 I simply adore these three fairies from the Fairy Princess set, Chloe, Tink and Eva. Sure, I also have the original, larger rubber versions of these cuties too but there is something really special about these fairies when they are shrunk down... kinda like all the mini sets that were recently on pre-order. 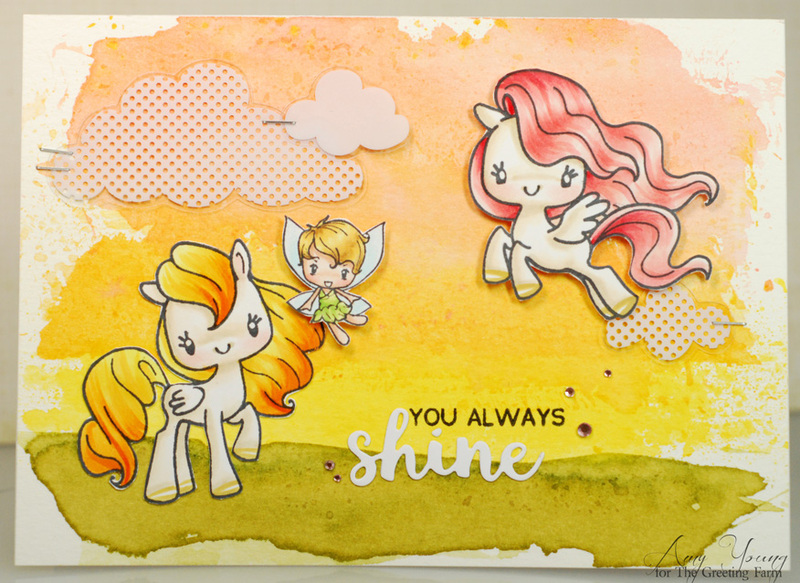 Which got me thinking about how awesome it would be if Marie came out with a new companion set of little fairies to go with these wee friends. Who else would love to see that happen?